the moon's outer shell of ice (more). 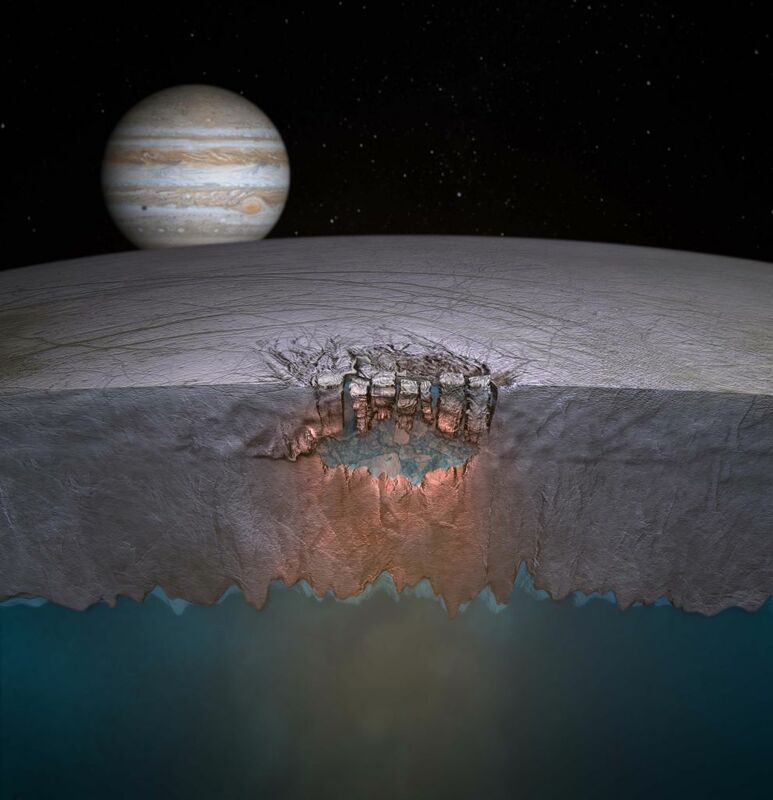 On November 16, 2011, scientists announced that data from NASA's Galileo probe (which operated from 1989 to 2003) appear to reveal at least two bodies of liquid water the volume of the North America's Great Lakes underneath the surface ice of Europa. Some scientists believe that such subsurface lakes of water provide potential habitats for Earth-type life. Galileo images of "two roughly circular, bumpy features" on Europa's surface ("chaos terrains") are similar to features on Earth involving ice shelves or glaciers overlaying volcanoes where thermal energy is transferred to the surface. 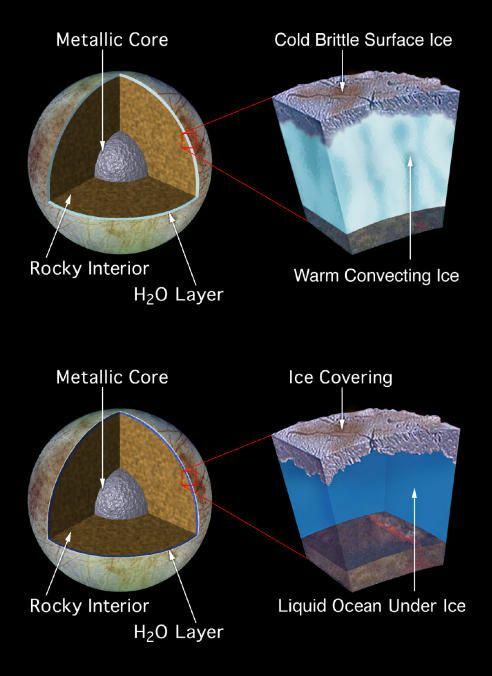 Chaos features on Europa's surface are likely to be formed by mechanisms that involve significant heat exchange between the icy shell and the underlying lake, which may provide a pathway for transferring nutrients as well as energy between the surface and the vast global ocean thought to exist below the thick ice shell (NASA science news; and press release). Video, or larger and jumbo illustrations. Lakes underlying areas of "chaos terrain"
suitable habitats for Earth-type life (more). 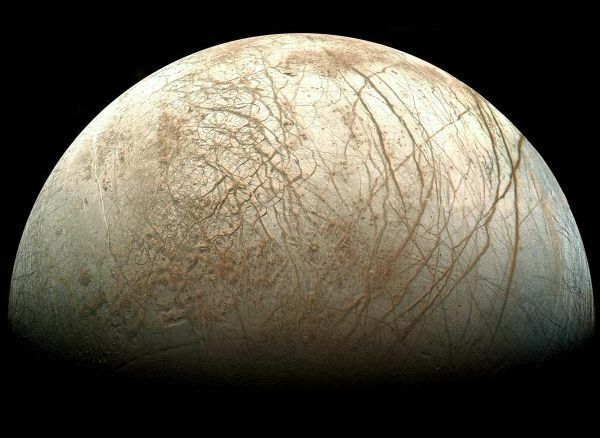 Europa (which is 12 percent smaller than Earth's Moon) appears to have a sparsely cratered shell of water ice that may be only 30 to 50 million years old, and so some resurfacing process must be renewing its icy shell. Most important, some of the ice below appears to have been melted by tidal heating from gravitational inteeractions of its mantle and core from its eccentric orbit about Jupiter and radioactive decay to create a deep global ocean of electrically conductive liquid such as salty water that generates fluctuations in the moon's magnetic pole (Walter S. Kiefer, 2002). Although past detailed mapping and measurements of impact craters on Jupiter’s large icy moons suggested that the thickness of Europa's ice crust ranges from around 12 miles (20 km) to 16 miles (25 km) thick, researchers hope that refined methods using combined measurements of gravity and the magnetic field made from orbit can better determine the ice crust's thickness as well as its salinity. by observing how the moon flexes and deforms and by measuring magnetic variations (Washington University press release). Although NASA terminated funding in 2005 for a proposed Jupiter Icy Moons Orbiter (which would have searched for evidence of sub-ice, oceanic life on Europa, Callisto, and Ganymede), the Agency was still funding the development of a robotic submarine for exploring the sub-ice oceans of those icy moons in 2007 (Kathleen M. Wong, New Scientist, December 14, 2007). a deep global ocean (more). Europa's ocean is believed to be around 62 miles (100 km) deep, ranging mostly between 80 and 170 km (50 and 110 miles. Such an ocean would have a volume equivalent to all of Earth's oceans combined. Even deeper oceans of 60 to 125 miles (100 to 200 km) are now believed to lie below surface ice on Callisto and Ganymede, which orbit further out from Jupiter. (More discussion of the ice-thickness issue is available at the Lunar and Planetary Institute). 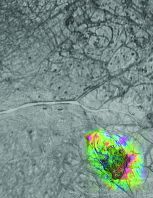 NASA's Galileo mission detected both carbon dioxide and sulphur dioxide, a possible sign of volcanism, leaking from certain areas on Europa's surface (Kathleen M. Wong, New Scientist, December 14, 2007). As significant uncertainties about the thickness of the surface ice still exist, some planetary scientists have identified two possible mechanisms for how possible volcanic heat can escape to the surface from Europa’s rocky mantle and be carried upward by buoyant oceanic currents. If the subsea heat is intense and the ice shell is thin enough, the surface ice shell can melt directly and cause regions of what appear to be broken, rotated, and tilted ice blocks, called "chaos" terrain (Nimmo and Giese, 2004; Spaun et al, 1999 and 1998; and Greenberg et al, 1998). On the other hand, if the ice shell is sufficiently thick, the less intense interior heat can be transferred to warmer ice at the bottom of the shell, with additional heat generated by tidal flexing of the warmer ice which can slowly rise and flow as do glaciers do on Earth; this slow but steady motion may also disrupt the extremely cold, brittle ice at the surface to produce the chaos regions. As tides raised by Jupiter in Europa’s ocean rise and fall, they may cause cracking, additional heating, and even venting of water vapor into the airless sky above Europa’s icy surface. 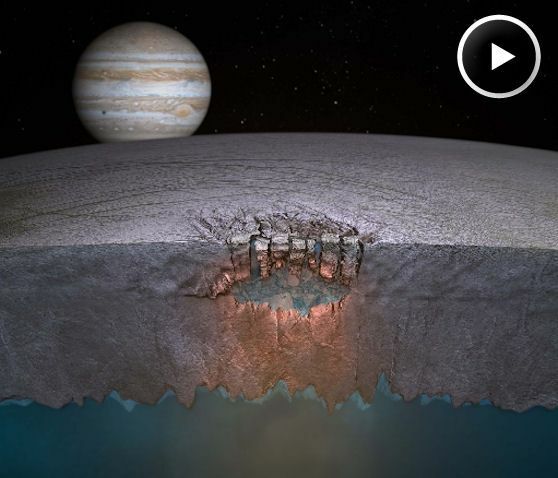 Biologists have speculated that, if liquid water does exist beneath Europa's shell of ice, then Earth-type microbial and even larger lifeforms may have developed. The near-infrared mapping spectrometer on NASA's Galileo spacecraft found evidence of the presence of molecules made of oxygen, carbon, sulfur, hydrogen, and nitrogen on Europa, and a hint of the presence of a class of complex organic compounds called tholins which may be driven by pre-biotic processes (more). Europa's briny ocean may also have an acidity similar to battery acid, rich in the sulfur compounds found on the other large Jovian moons. The presence of sulfur and sulfuric acid, however, may have also been present on the early Earth and is compatible with many extreme environments where bacteria have evolved biochemical processes to extract energy without sunlight (e.g., to extract energy from the charged reactions of sulfuric acid). Potential Europan habitats include deep-sea colonies based on heat-loving bacteria like those found around hydrothermal vents on Earth's ocean floor. These vents (also know as black smokers) expel minerals dissolved by water which bacteria use to in chemical reactions to produce energy and support ecosystems involving larger multi-cellular lifeforms that feed off of of the massive and fast-growing bacterial populations. Biologists believe that life on Earth could have started in such hot habitats sulfurous around hydrothermal vents, because the vent environment have little oxygen and harmful Solar radiation which can damage primitive molecules. 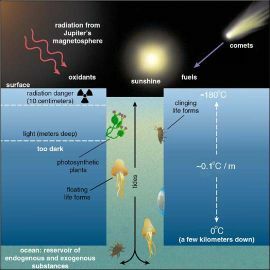 Many organic molecules needed for life could even have formed below the ocean floor from interactions between minerals and circulating hot water driven these hydrothermal ven systems. 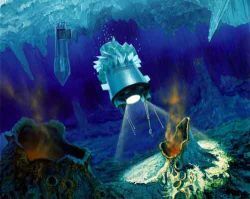 In 2002, planetary scientist Richard Greenberg proposed that Europa's biosphere could include lifeforms adapted to niches provided by the cracks in its icy crust. Although radiation from Jupiter's magnetosphere would be harmful to life on Europa's surface down to a depth of a few centimeters, sunlight could sustain photosynthetic organisms beneath the ice to a depth of several meters. Clinging lifeforms might scale the walls of the cracks and even hibernate within the walls, whereas floating life forms may be able to move with the tides as the cracks open and close on a daily cycle (David L. Chandler, New Scientist, October 20, 2002). 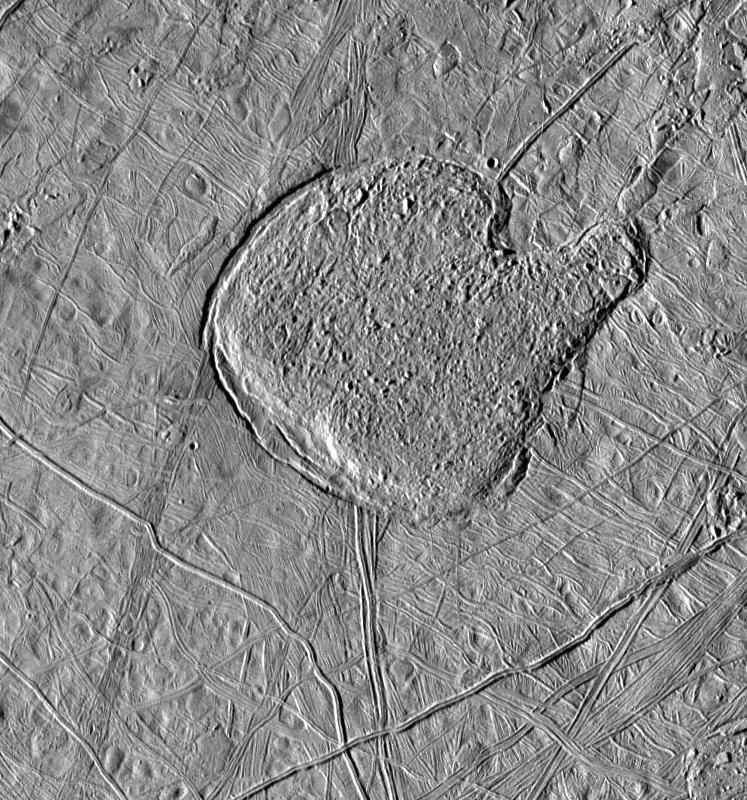 If past analysis of Europa's craters with those on Callisto and Ganymede indicated, however, that Europa's crust may relatively thick at around 12 miles (20 km) to 16 miles (25 km) thick prove true, then such ice-crack habitats would be unlikely. Try the NASA Astrobiology Institute (NAI) and NASA's Galileo Mission page on Europa. .
© 2007 Sol Company. All Rights Reserved.